Passport to Dreams Old & New: What's in A Sign? I think that until the opening of Disneyland Paris in 1992, Magic Kingdom was the theme park with the most interesting, unique collection of...... signs. Signs are interesting things in theme parks. They don't often get a lot of attention and coverage, but they really belong to that category of theme park grace notes which visitors would miss if they weren't so nicely done. Magic Kingdom's original crop of signs were, in many ways, dead simple. Many of them were simply flat, painted surfaces in a variety of evocative shapes. Especially since the 1990s, theme park signs have become increasingly dimensional and elaborate, sometimes turning into light shows or kinetic sculptures. Yet its the dead simplicity of those early Magic Kingdom signs which appeals to me. They often had nothing more to work with than typefaces, shape, and color. But sometimes, that's all you need. Indeed, some modern theme park signs are better than the attractions they lead to or the architecture they adorn. The earliest Magic Kingdom signs worked with the architecture like a hand inside a glove. 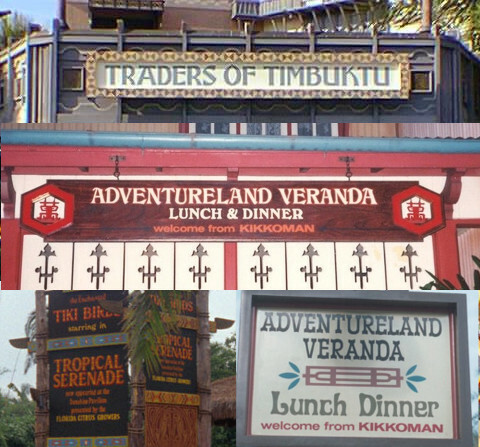 Consider Adventureland, the Magic Kingdom area with probably the nicest collection of signs and typefaces. Fantasyland went all-in on Gothic letters and Tomorrowland was a sea of handsome, sans-serif fonts. But in Adventureland, the rules could be loosened or broken. Let's take a moment to consider why this is. At Disneyland, Adventureland goes heavy on the "Tiki" styling: carved masks, skulls on poles, and a rugged outpost feeling. At Disneyland Paris, it's adventure literature of a long ago childhood brought to life. Tokyo Disneyland has a bustling tropical plaza. 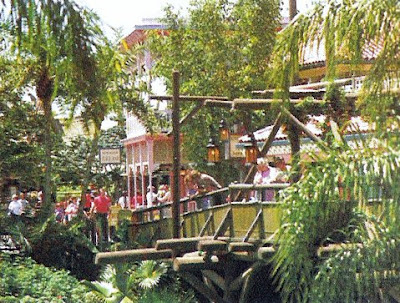 Magic Kingdom's Adventureland is the only Adventureland which is feminine, which may partly explain why I favor it. It's all flowing lines, layered details, and complex carvings. It has architecture which manages to evoke the Caribbean, Asia, India and the South Seas without specifically replicating any single element of these cultures. 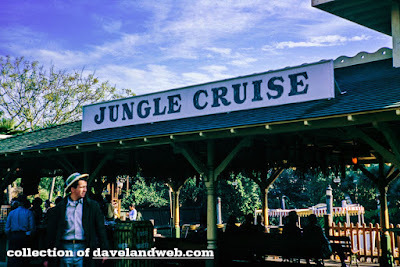 In other words, in the place of the elephant gun and dive bar ethos best reflected at Disneyland, Magic Kingdom's Adventureland evokes lazy evenings on tropical verandas being fanned with banana leaves, and lazily turning fans. It's a Henry Mancini exotica record frozen in architectural form. A diverse range of fonts were selected to convey this impression, and largely the main rule seemed to be that anything that went heavy on serifs and looked "fancy" would do nicely. It's a broad range of styles which reflect the notion of a romantic (if unspecific) tropical fantasy. Let's take a close look now at one specific example, how its signage changed over the years, and how this subtly affects the meaning and presentation of the attraction: The Jungle Cruise. 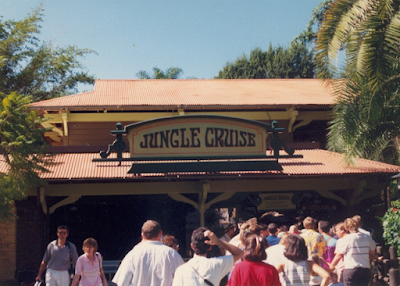 By the time the Magic Kingdom was being built in 1971, Disneyland had years before pulled down their original Jungle Cruise boathouse (above) and replaced it with a series of huts and thatched roofs to allowed greater queueing space. So it's perhaps interesting that when WED built a new boathouse in 1971 that was more or less an architectural copy of the original one. The sign can be read, but not in any real clarity. Thankfully the same font that's used here was used for years afterwards for the ride's advertisement on the side of the Main Street omnibus, tasteful placards which were reproduced in The Poster Art of the Disney Parks. It's perhaps a little too easy to fault this one for being too plain. Jerry's photograph does demonstrate how in this original 1971 arrangement, it was possible to enjoy the simple, rather spare Victorian design of the boathouse, which was fancy in a rather simple way. It was old fashioned in an unspectacular way, and the Boathouse still is amazingly effective at conveying the idea that it's been there in the middle of nowhere for a long time without finger pointing. Windsor as a typeface choice is similarly classical yet restrained, echoing the original concept for a simple building which is the embarkation point for a huge adventure. 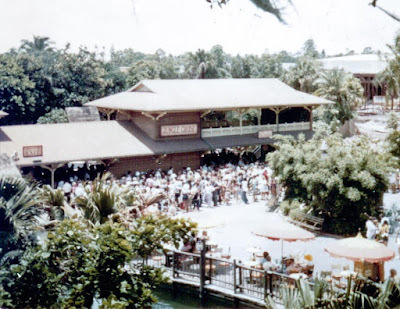 The first changes came in 1973, shortly ahead of the opening of Pirates of the Caribbean. The entire queue was reworked, expanded out towards the new ride, and the entire area where you see those rope switchbacks in Jerry's photo was covered with a roof. Because the 1971 sign would now be located so far away from the pedestrian space that it would not be seen, a new one was created, and it's a doozy. For years I thought this had to be a hand-lettered logo, simply for being so weird. I was somewhat right, in the sense that any sign produced in 1973 was going to be painted and cut by hand, producing eccentricities. But it actually was a real font, and a contemporary one in 1973: Barker Flare, which has been digitized by Canada Type as Plywood. I produced mine by tracing from a photo. This is one of my favorite attraction signs ever. Barker Flare is idiosyncratic - it's completely modern in design, with those upward thrusting serifs on the R, L and E. It wouldn't be out of place alongside a hippie poster's bubble text. Yet it's also undoubtedly old fashioned, placing it in the era's love for Victorian and Victorian-style fonts, such as the elongated version of Rubens used for the Haunted Mansion's marquee. There's something to it which suggest the organic, flowing curves of art nouveau. And it's that art nouveau connection which so easily suggests, especially in the context of the ride it was affixed to, the reaching vines of the jungle without being too overt about it. In other words it was a precise middle ground between being modern looking while still looking a little old fashioned while also looking vaugely, indefinably exotic - perfect for a modern, but wholly old-fashioned excursion into the unknown. That's right, don't forget that in 1973 there was no hint that the Jungle Cruise was taking place at any time other than right now. Yes, it was a Hollywood-style escapism as well, but with details like red-striped candy colored boat canopies and a bright orange camping tent for the gorillas to cavort in, we clearly weren't back in the Great Depression, either. 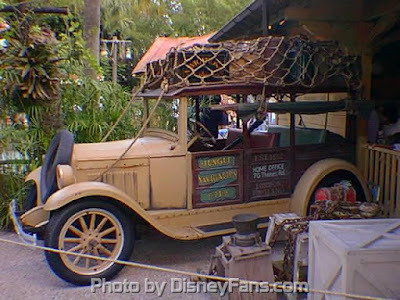 So it's interesting to note that not only was the Magic Kingdom Jungle the first to get "sent back" to the 1930s, but that this was accomplished in 1991 with relatively few changes. By far the bulk of them came to the queue, which besides gaining vintage music, got an entirely reworked entrance area. If you never saw this in person you may be shocked at how elaborate this was, because it's all gone now. A giant mass of pilings anchored a huge mast which on one side supported a gigantic sign. Spears were stuck in the sign as though they had been thrown out of the jungle and become lodged there. A vintage delivery vehicle welcomed visitors, along with boxes for delivery and an engine being worked on. At this time the familiar "boat rudder" marquee also appeared at the top of the hill, beckoning visitors to come check out the Jungle Cruise, just as it does to this day. With the new theme and new time period, a new logo also appeared. Given the fact that I've heaped praise on the weirdo 1973 sign you may be forgiven for thinking that I wouldn't like this one, but I do. The hand-lettered look and complex capitals conveys a vintage atmosphere which sets the stage for what's to come. The wave that the words inscribe suggest a relaxing experience while the informal quality of the letters suggests that it won't be entirely serious. 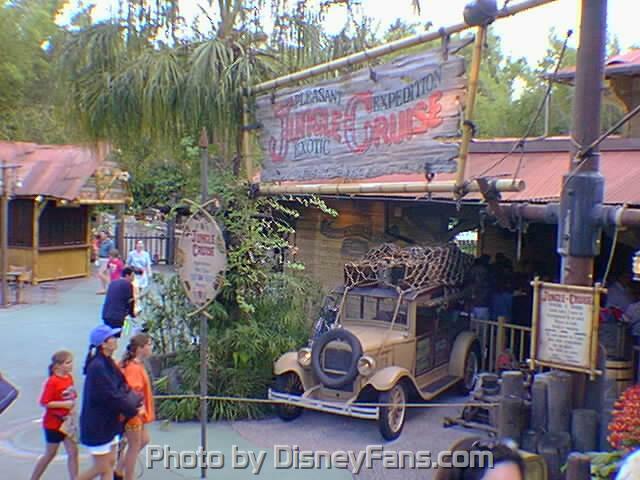 And, best of all, it's never been used by a Jungle Cruise in any other park, so it belongs wholly to the Magic Kingdom ride. Certainly given the tone of the ride and the two terrific logos it's had since, one could be forgiven for thinking that the short lived, handsome 1971 logo is just too darn serious. There was no logo change this time. 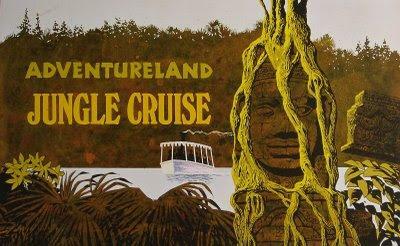 After twenty years, the Jungle Cruise finally had a graphic identity she could live with. 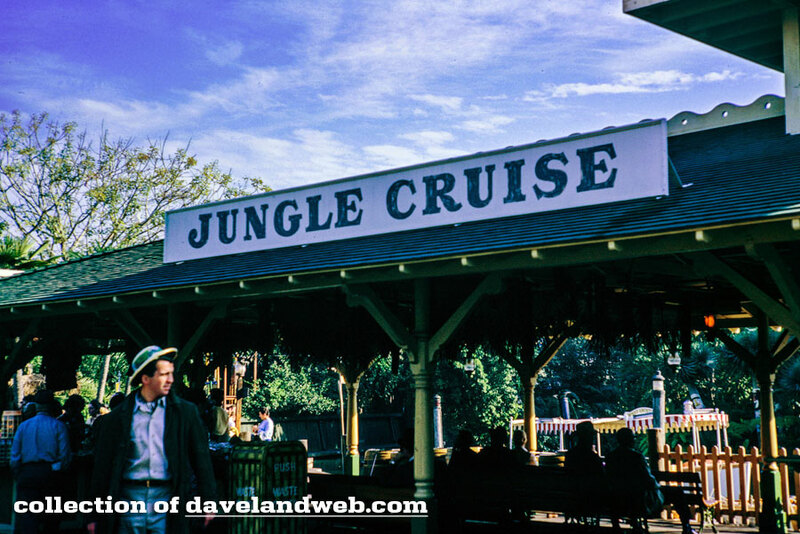 In some ways, the Jungle Cruise is an abnormality. Most rides don't change their signs, ever. Here's a ride that's had three good ones and not one of them is at all similar to any of the others. In our day to day world, signs are functional and not much else - does anybody seriously frequent, say, a Chinese takeout place with a sign you'd be willing to hang in your house? In theme parks the attentively designed, carefully crafted signs are part of the thoroughly manicured impression the parks exude. They help create the "play space" where everything is beautiful and everything, even the smallest detail, has been put in place entirely for the pleasure of the viewer. Another great post about a ride that I'm especially fond of. Thanks! Great text! Being a graphic designer, I love everything that has to do with signs, specially those themed ones. I’ve always loved the aesthetic of the Magic Kingdom’s Adventureland with its blending of imperial Victorian confidence and tropical languor. The revival of the shamefully neglected Adventureland Veranda is welcome on almost any terms, but I wonder how the tropical Victorian vibe will fare in the renovation. As I understand it, the planned restaurant is to be themed around the Jungle Cruise skippers. I can easily imagine the new space themed to the “elephant gun and dive bar ethos.” It will be interesting to see how this is handled and what it may do to the thematic continuity of that part of Adventureland. I love the exploration of fonts! Thank you for including the links to those you'd actually find online. It'd be great to see a collection of them from around all the parks. Great post and photos. Thank you so much for sharing.